He has never forgotten that experience. After spending some years working up to a position as a restaurant server in one of the top restaurants in Caracas, Venezuela, Chef Vittorio moved to Boston to study culinary arts. That’s when he “realized his calling…and the kitchen was the key to unlock his creativity.” For the next 12 years, he cooked in restaurants around the world. And he didn’t stop there. By 2011, he opened A Tavola (named for the Italian expression “at the table, let’s eat!”), an “eclectic Italian restaurant” in nearby Winchester (www.atavolawinchester.com). At both restaurants, Chef Vittorio says he sources ingredients locally as much as possible. 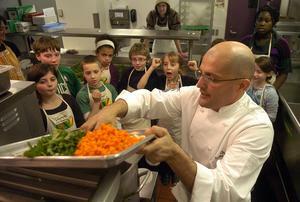 And, just as he does with his own children, Chef Vittorio enjoys finding new ways to help kids learn where food comes from. Drawing on his family’s tradition of growing vegetables in the backyard, he has gone on to develop a program at his children’s Winchester elementary school, called Seed to Plate. Children at the Ambrose Elementary School plant a vegetable garden each spring near their school, and harvest the vegetables in the fall to make a dinner for their parents with Chef Vittorio. Chef Vittorio says Kids Cooking Green and Seed to Plate are two organizations through which he can give back to the communities where he lives and works.